Towards the end of 2011, the University of Manchester announced its £61 million National Graphene Institute (NGI), which is nearly complete and will be one of the leading graphene research centers in the world. Now there are reports that the UK Chancellor, George Osborne, will unveil plans for a second £60 million graphene center in Manchester. 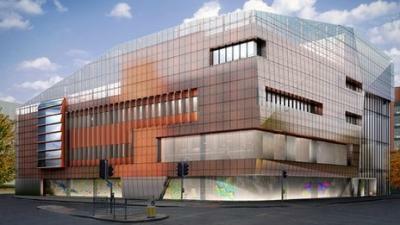 The new center will be called the Graphene Engineering Innovation Centre. Apparently it will be aimed towards development of graphene-based products with an eye on commercialization. The UK hopes that the new center, together with the NGI, will make Manchester and the UK in a position to lead the world in graphene technology. Half of the funding for the new center will come from Abu Dhabi investors Masdar, and the rest will come from the UK government and the University (which is expected to reach out for the EU for part of the funding). In addition to the new graphene center, the UK also has plans to open yet another national institute for materials research - also in the north of England.